To be honest, I love pizza I have to pay for, too — but free really sweetens the deal. When I’m on the road, I always look for a nearby Domino’s, mostly because its signature Tracker gives me a (probably false) sense of control over my delivery order — and control comforts me. So I was pretty excited when Domino’s announced a new Quikly deal. The pizza giant is giving away more than 37,000 gift cards between $4 and $100. The catch is you have to be fast. The promotion could start anytime between now and Nov. 7, and prizes are awarded on a first-come, first-served basis. Sign up with your phone number to receive text messages. When the promotion goes live, Domino’s will text you a secret link. Click on that link to sign up — the faster you get in, the better your reward! You’ll get a few options to give you an edge in the game. If you share the promotion with friends, you’ll earn an extra three minutes for each one who signs up. You can also earn extra minutes by signing up to receive Domino’s offers by mail and following the company on Instagram. I earned five extra minutes by sharing the link with a friend and following Domino’s on Instagram — but I’m not so keen on a snail mail subscription, so I’m skipping that bonus. The secret link will go out to everyone at the same time, but I’ll get a heads-up text five minutes in advance to let me know the promotion is about to go live. That five-minute warning should be a big help. I wasn’t so quick during the first Domino’s Quikly promo: While my boyfriend acted on his text immediately and earned a $4 gift card, I was about half an hour behind and only got a 20% off coupon. The second and third entries will earn $100 and $50 gift cards, respectively. 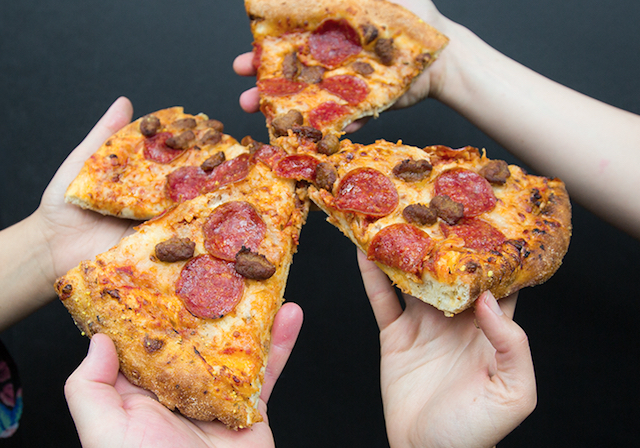 The next 2,000 entries will earn a $10 gift card — enough for a free pizza. The remaining 35,000 entries will win gift cards for $4 or $5. Your Turn: How much extra time did you earn for this promotion?